What is Depo-Medrol used for? 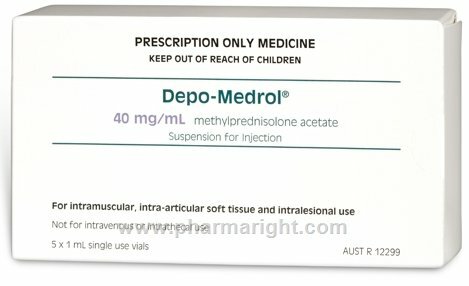 Depo-Medrol injection 40mg/ml is used for a wide range of conditions where intervention with a steroid medication is needed, either to replace a lack of naturally produced hormone or to treat various inflammatory, allergic and immune disorders to suppress clinical symptoms of the disease; also to treat and prevent exacerbations. Depo-Medrol injection is used when oral administration is not suitable and is used to treat local or systemic disorders. For local inflammatory or rheumatic symptoms Depo-Medrol is injected into a local site such as a joint or into soft tissue. Local conditions that Depo-Medrol injection is used for include treatment of acute symptoms or to prevent exacerbations in rheumatic diseases like rheumatoid arthritis and ankylosing spondylitis (inflammation in the spine), acute gouty arthritis; also inflammation in joints and tendons, including tenosynovitis (inflammation of the tendon sheath), bursitis (inflammation if the fluid filled spaces around joints) and epicondylitis (tennis elbow). Depo-Medrol injection 40mg/ml is also used to treat systemic allergic, inflammatory or rheumatic conditions when injected into the muscle. These include rheumatic disorders like rheumatoid arthritis and ankylosing spondylitis (inflammation in the spine); collagen diseases like systemic lupus erythematosus, arteritis (inflammation of an artery), systemic dermatomyositis and polymyositis (inflammation of the muscles) and rheumatic fever; skin disorders like pemphigus (severe blistering of the skin and mucous membranes) and severe dermatitis and eczema; severe allergy like allergic asthma and allergic rhinitis; eye disorders like optic neuritis (inflammation of the optic nerve) and uveitis (inflammation of the middle layer of the eye); respiratory disorders like pulmonary tuberculosis and pulmonary sarcoidosis (nodules of inflammatory cells in the lungs); allergic reactions like atopic dermatitis, drug hypersensitivity reactions; gastrointestinal diseases like Crohn's disease and ulcerative colitis; immune-mediated disorders of the blood like thrombocytopenia purpura (low platelet count), haemolytic anaemia. Depo-Medrol injection is also used for hormone replacement therapy in conditions where the adrenal glands do not make enough of the natural hormone cortisol, such as in adrenal insufficiency and congenital adrenal hyperplasia and hypercalcaemia associated with cancer. Depo-Medrol injection is also used for palliative management of certain tumours of the blood like leukemia and lymphoma; to prevent rejection following organ transplant; to treat acute exacerbations of multiple sclerosis; and to treat meningitis caused by tuberculosis. Other administration routes include injection into a lesion such as inflammatory lesions of the skin conditions lichen planus and discoid lupus erythematosus. Depo-Medrol injection 40mg/ml works by the same mechanism of action to treat these various conditions. Depo-Medrol injection contains methylprednisolone, which is a synthetic corticosteroid hormone (or glucocorticoid), similar to prednisolone but more potent and both are similar to the naturally occurring cortisol (also known as hydrocortisone), which is commonly referred to as the stress hormone. Natural and synthetic corticosteroids have potent anti-inflammatory, anti-allergic, anti-rheumatic and immunosuppressant properties. They have widespread effects acting on most tissues in the body to modify, carbohydrate, fat, protein and calcium metabolism. They also regulate salt and water balance, decrease bone formation, suppress the immune system and inhibit inflammatory reactions. Methylprednisolone in Depo-Medrol injection works by entering the cells of the target tissues and binding to an intracellular receptor. The major therapeutic actions of methylprednisolone in Medrol injection 40mg are to reduce the inflammatory response primarily by blocking the production of inflammatory chemicals, like prostaglandins and leukotrienes from inflammatory cells to reduce the swelling, redness and pain associated with inflammation. It also modifies the actions of cells involved in immune and allergic responses, and suppresses the immune system, which helps in autoimmune disorders, where the immune system attacks self; and helps prevent rejection following organ transplant. Depo-Medrol injection contains the active ingredient methylprednisolone acetate (40mg/ml), a synthetic corticosteroid used to hormone, used to treat a wide range of inflammatory, allergic and immune disorders. Depo-Medrol is provided as a 1ml solution in an ampoule for a single dose administration. It also contains contains myristyl-gamma-picolinium chloride (0.02%) as a preservative. Depo-Medrol injection 40mg/ml contains methylprednisolone, a synthetic corticosteroid hormone with potent anti-inflammatory, anti-allergic, anti-rheumatic and immunosuppressant properties that works in a similar way to the naturally occurring hormone cortisol but is much more potent. Depo-Medrol 40mg/ml injection is used for a wide range of conditions to treat various inflammatory, allergic and immune disorders to suppress clinical symptoms of the disease also to treat and prevent exacerbations. Methylprednisolone in Depo-Medrol injection works by blocking the production of inflammatory chemicals, like prostaglandins and leukotrienes, from inflammatory cells; it also modifies the actions of cells involved in allergic and immune responses. This action helps reduce symptoms of inflammation caused by many different factors, for example, where the immune system is overactive, like severe asthma, acute outbreaks of eczema and severe allergies like allergic rhinitis; autoimmune diseases, where the immune system is directed against self, like rheumatoid arthritis, systemic lupus erythematosus or Crohn's disease. What are the side effects of Depo-Medrol? The most commonly reported side effects when using Depo-Medrol injection include: increased susceptibility to infection, muscle or bone aches and pains, fluid retention, weight gain, hypertension (high blood pressure), thinning of skin, bone demineralisation, slow wound healing, acne, peptic ulcers, redistribution of body fat creating the typical moon face, altered vision. What are the health risks of taking Depo-Medrol? Long term use of Depo-Medrol injection 40mg/ml may cause the adrenal glands, which produce endogenous (naturally occurring) corticosteroids, to stop working efficiently. This may slow down the growth rate in children and will need regular monitoring. Depo-Medrol injection may also cause decreased bone mineral density, if used for long periods. Long term use of steroids may be associated with a range of side effects such as; round face, altered body shape, altered hair growth, thinning of the bones, decreased resistance to infection, increased blood pressure and diabetes. When should Depo-Medrol not be used? What medications interact with Depo-Medrol? How should Depo-Medrol be given? You will be given an injection of Depo-Medrol 40mg/ml using sterile techniques to prevent risk of infection, into the site appropriate for the treatment you are receiving. The dose you are given, how often and for how long depends of your doctor’s recommendation and what you are being treated for. Joint injections may be given weekly over a period of several weeks, depending on how quickly you respond to treatment. Other treatments may only require a single injection. Injection sites include, intramuscular (into the muscle), intra-articular (into a joint), periarticular (into tissues surrounding a joint), intrabursal (into the fluid filled sac surrounding joints), intralesional (into a lesion) and into the tendon sheath. If you have been given Depo-Medrol injection for more than three weeks or received high doses, you will need to come off this treatment slowly to reduce risk of withdrawal symptoms. How long should you use Depo-Medrol? The dose of Depo-Medrol injection40mg/ml you are given, how often and for how long depends of your doctor’s recommendation and what you are being treated for, and may be a single injection or several injections over several weeks. If you have been given Depo-Medrol injection for more than three weeks or received high doses, you will need to come off this treatment slowly to reduce risk of withdrawal symptoms. How should Depo-Medrol be stored? You should store your Depo-Medrol below 25°C in a cool dry place. Once an ampoule has been used, discard any remaining content, it should not be stored and reused.